Build a Free Website now – It takes just a few Seconds..
SiteRubix is website building platform powered by Wealthy Affiliate, that takes building websites to a completely new level. All the technical aspects of building websites is completely removed, allowing you to be up & running within seconds. It’s paired it up with Wealthy Affiliate training, tools & community support that allows you to create valuable experience. With powerful & versatile website building tools the possibilities are limitless & will go as far as your imagination does. Whether you take advantage of Wealthy Affiliate instant website setup, which provides you a sub-domain..
..or you create premium websites on domains you own – In both cases, WA facilitates these processes & enables you to leave all technicalities behind you. Furthermore, WA hosts your domains, both sub-domains provided by WA & domains that you own. Site Rubix is a complete, all in one package with free starter membership account, 24/7 support, training & helpful community. Can’t get any more professional than that – Very simple yet responsive & powerful. SiteRubix is extremely easy to use & incredibly efficient – create fully functional high-end websites within seconds. So, you’re complete beginner to Website Builder? 1Choose a domain name: Write it into domain name sign-up box & check its availability – That’s Step 1. 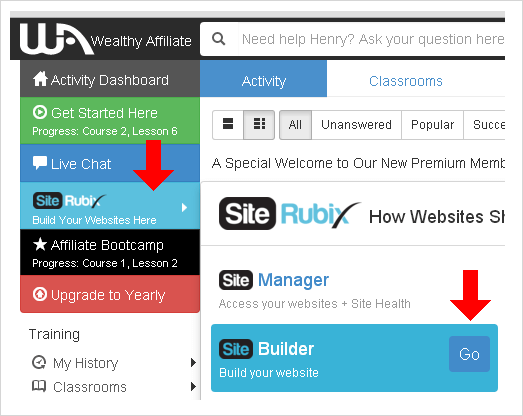 As a Starter Member you have access to Site Rubix Website Building platform tools & you can build 2 Free Websites within Site Builder, which are hosted at Wealthy Affiliate siterubix.com sub-domain. Simply select “A Free Website” & write the domain name – Domain name is PERMANENT, so choose wisely. It’s recommended to have a domain name that’s easy to remember for people & is relevant to your niche at the same time. But of course, it’s entirely up to you, to choose a direction & pick the one you like. 2Write a name for your brand new website. Write it into website name sign-up box – That’s Step 2. You can change this at any time, so don’t worry at all about it not being perfect at the start. In a similar manner with domain names, this one also should be relevant to your niche. It will be the visible frontier in search engines, as your website name is something that represents your website & its identity at first glance. You can choose anything that you feel yourself comfortable with & you’re good to go. 3Choose a theme for your new website – Pick a theme that you like from theme-list – This is step 3. Theme is a set of templates that will be stored in your WordPress account to form your websites appearance. In simple words, you can choose how your website is going to look like. Theme will be the “face” of your website & will be configured through WordPress platform. You can access your websites through your personal WordPress account & via Wealthy Affiliate members area dashboard, with 3 clicks, which leads to every tool related to your websites. It’s super easy, unbelievably compact, all tied into one place together. It’s even easier to do, than to describe how to do it. The choice of theme will be big part of your success. As starter member you have access to 6 beautiful themes. Visual side of your website will be immensely important & as you notice there are details available for you to read about themes that you might be interested in. Remember, people are very visual, they rather love to see your ideas than simply read about them. In short comprehensive manner details will usually provide general info & describe the functionality of a theme. You can also click on “Demo” below themes thumbnail which will take you to short introduction, to show you how that theme looks like in live version you picked. Remember, you can store all of your favorite themes, & also change your websites theme at any time..
& as many times as you like! With a single simple click! Don’t just build one.. Make it look stunning! These are professional designs, responsive & mobile ready. 50% traffic goes through mobile phones, so don’t miss out! For premium members, there are hundreds of themes available, & more are being added in to this list every week. Try not to get overwhelmed! There are literally unlimited ways how you can represent your website & your ideas. Be careful to not get lost in this ocean of endless opportunity. Feel free, to pick the best one for you & make your website look amazing. Know that they’re versatile & accessible for different screen sizes: desktops, tablets & smartphones. Through different means, broadcast your achievements to the whole wide world if you like. 4Step 4 – Click “Build My Website”. Relax, sit back & see how your website is being generated in a few sec..
You have set your Domain name, Website name & Theme – Now click “I’m Ready, Build My Website Now!” & Site Rubix Site Builder will generate your brand new website. Impressive isn’t it? Congratulations, you just finished building your first SiteRubix Website! !Optional – Premium Upgrade Feature – Maybe you have an existing website & you want to host it at WA? This is an excellent option for you to bring your existing website over to Wealthy Affiliate & use Site Rubix platform as your brand new host – It’s super easy & you can literally complete domain transfer with a click of a button! This option intended for advanced members & not required for beginners. You don’t need it in order to get started & build A Free Website. Instead of creating new Siterubix sub-domain, you can add & host your custom domains at WA. As premium member you can build 50 websites instead of 2, & you can also host domains that you own in WA. Never worry about your data being stuck at one place! With SiteRubix powerful tools, you can transfer all of your websites data from Siterubix sub-domain (the free website that you started out with etc) to your own domain with a click of a button. Rembember, with SiteRubix you can always transfer your websites data – in to OR out of Wealthy Affiliate..
It’s incredibly easy to do thanks to SiteRubix Site Manager technical support features. It’s effective, saves you a ton of time & you can completely avoid all the hassle! Thanks to transfer system, you can always choose where do you want to host your website. Site Rubix is excellent platform for those who like to be part of Wealthy Affiliate community & host their own domains at WA at the same time. This is an exclusive premium feature available for premium members only. As a free member, it’s not necessity to have access to this feature – Free website in siterubix sub-domain covers everything you need, for no cost at all. What’s Special about SiteRubix Premium Membership? If you’re complete newbie & don’t know anything about building websites, this is absolutely brilliant deal for you. It gets you set up & running for free, with no additional cost. It’s focused on building initial framework for your new site. Absolutely great deal, shows you step by step how to do it & makes it very easy for anyone who has never done something like this before – Helps you to get started, up & running without having ANY prior knowledge. This is for those who already have an existing website OR wants a custom domain to up their game. If you have an existing website OR you’re at the stage where you’re ready to create a custom domain, this is the way to go – You’ll get a bunch of improved stuff to keep you busy. If your main goal is to have a secure website with many more features on it – This is definitely superb offer for you. Get all of your modern websites tools & training from one place – An exciting place where you can learn how to be on top of your game & lead a successful venture. I hope you enjoyed reading my review & learned a lot about SiteRubix along the way. Thanks for sharing this article! I am new to affiliate marketing and this article really helped give me the courage to try it out! I applied and joined Wealthy Affiliate and so far, the training is very comprehensive. Most importantly, it’s very easy to learn even for a beginner like myself. I’m glad I’ve helped you to get started. This is also the way how I built my first, my second & my third website..
Well I was planning on using one of those free wix sites but I noticed they have advertising on them – this could be a much better choice…if it really is free? I’m interested in starting up a photography blog – do you feel that site rubix would be a good fit for this and is there themes that cater for this? Site Rubix helps you to easily build WordPress site in less than 30 sec. Wix free version includes adds on your site – It’s a marketing stunt to force you to go premium. Wix has made excellent job at marketing their product.. good for them! It’s a solid product, but despite that fact.. There are hundreds of themes in WordPress that are designed for gallery-like sites to build beautiful photography blogs. Both free & premium versions, so the choice is yours. Site Rubix helps you to get up & running in seconds, without you downloading OR installing anything into your own computer. SiteRubix is actually the software I used to build my first website and it only took seconds to accomplish – it was an amazing feeling to know I owned something live on the internet. In conjunction with my site, I was supported by the community and training at Wealthy Affiliate, and without it, who knows where I’d be today – probably not making an income online. I have to give credit to both of these two services for getting me started on an awesome path. Absolutely great to hear how many folks are pleased with what SiteRubix has to offer us. I can relate to that & I’m still amazed of the bundle this platform offers. Like you, it’s pretty much exactly how I felt & the process I went through. First site for me as well. I remember, some time ago they didn’t have domain registrar as option.. ..BUT now they have this “toy” as well on the board. All the necessary tools in one place together to make it work quickly & effectively. I am a member of the Wealthy Affiliate community and use SiteRubix to build my site. It is a great tool for anyone knew and experience who wants to create a website. One of the things I find useful is that it shows the health of your site. One indicator that I am not sure about is Site Trust. Does this grow in time? For me it still says that it is at 10% even though I have been doing my site for two months now. Yes indeed, it always takes time before search engines start trusting your site.. I have it up 100% & the pattern I noticed is that it increases about 10% each month. In other words, it means that a site must be up & running at least a full year before search engines will completely trust that particular site. Using siterubix is what i did when i started out with website creation for my first time.As at then,i was not having enough cash to purchase other soft-wares with their prices ,and its up-sells like go-daddy,host-gator and others.But now as little as i started ,i have build an empire of websites all from siterubix at very cheap price with no up-sells,kudos to Wealthy Affiliate.But Henry Thanks for sharing,that’s very kind from you. Thanks Roland for stopping by & sharing your story! I can relate to that. I’m glad you’ve found SiteRubix incredibly useful. Indeed, SiteRubix is the place where you want to start to make things simple & stay in budget as well. Hey Henry, I have to agree with on how site rubix is a great tool especially for beginners. When I first started building websites I used the site rubix platform. I never kept up with my first ones, since I was only practicing. I do have a question, how difficult is it to transfer the domain name from the site rubix to an actual .com? Or can you even do that? Thanks again for the simple walkthrough on how to use this platform. I will for sure share this with my friends interested in building a website. Have a great day. Transferring to your domain is super easy & you can do it at any time & as many times as you like. 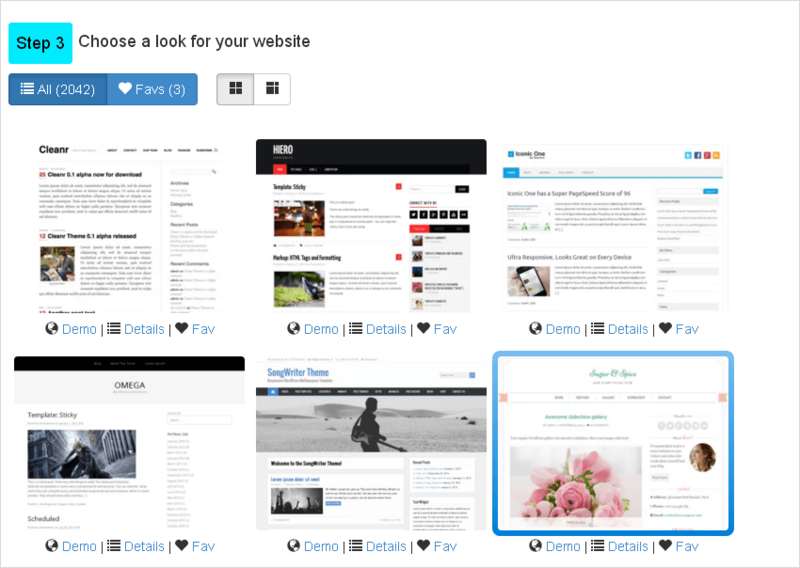 You can find all the tools in a bundle on your personal WA website access panel. As beginner it’s excellent to start out with rubix sub-domain & later on transfer entire websites data. The SiteRubix Software is by far one of the most flawless applications I have used to date. An appealing aspect is the ease of use for beginners. Being able to build a professional looking website with SiteRubix in less than a minute is another attraction for me. A free domain name and hosting ticks all the boxes too. Great Review, Great Read! Thanks Michelle, so many kind words! A true all in one bundle indeed. I too enjoy the fact we can completely focus & take care of beginners with SiteRubix at the same time. Who knew starting new things can be so simple? A nice and thorough review of the Siterubix Website Building Software. It is certainly one of the easiest and most complete website builders I’ve ever come across. Nowadays there are so many people turning to the internet for answers and buying products online that anyone who wants to build a successful business needs a website. For the people that can’t afford a professional website designer or like to be more in control and build the site themselves Siterubix is definitely the answer. This exactly what a lot of us need – Very easy to use yet effective software to get our project rolling quickly. The fact you can be in control & make a tremendous start completely free makes it even better. Well, who else could offer us all of that? Site Rubix indeed is a great tool if you have never built a website of your own. I didn’t know anything about building a website until I learned about this program and now I have my own website that’s built very easily. I do recommend any one that wants to start their own website and never have built one before. Thanks for your visit & support Joon! Same thing here, I had no idea once I wanted to start a web. Wonderful tool whether you’re a beginner or expert to make progress. And a big time saver that one! So many kind words. It’s good to hear that it has potential to encourage newcomers. This is what’s it all about – to help someone who’s new to these wonderful opportunities. This is the first SiteRubix Software Review I’ve read. You did a nice job of explaining how easy it is to build a website in less than a minute compared to the past. It’s fun to suddenly become a webmaster when all you knew starting up was how to hit the “enter” button. Wealthy Affiliate platform is an amazing online training course that left nothing to chance by providing everything you need to start a successful online business. It’s nice to have this free option of the Wealthy Affiliate platform to test the waters before deciding to take the plunge into Premium. You’re absolutely right! I was so skeptic about it when I started at WA, but it’s amazing how this free option can turn the tables for you. It did it for me as it gives a freedom of choice & room to breathe to let you decide if it’s worth your time.. no head-first type of diving or super important decisions.. just a light & fun approach! I love siterubix because it literally makes making websites way too simple. You can literally do everything from one little app in a sense but from the computer! the only thing I would truly reccommend is if you are already going to use siterubix, you might as well be part of Wealthy affiliate too because they basically go hand and hand! Crazy deal right? And on top of that you can access both of them, & take WA & Siterubix to test-drive for free. I always dreamed of something & now it’s literally part of my reality. Hi Henry, great breakdown of SiteRubix. I have a question – how did you get the cool ‘read more’ images in your post? Did it come with the theme or did you code it in? I can attest that SiteRubix has broken down the technological barrier that has prevented me from setting up a site for so long. Kinda tricky combination-mix of both – I did code it in with short-codes meanwhile.. These flashy icons above are part of themes templates kit, but the “Read More..” buttons below are separate detail from a widget called Max Buttons. Basically you can create highly custom buttons with your chosen text & color. There’s like colors, gradient, shadows… dimensions, borders & much much more. Different shapes & sizes. In short words – very detailed buttons! This widget has both free & upgraded versions. A very detailed guide on how to create a website using siterubix. Prior to this, I never thought that building a site could be so easy. Html and all that technology stuff can be quite daunting is it? What are some of your favourite themes? Do you have any that you would like to recommend? Yes indeed, exact same thing here – Before discovering SiteRubix, I had all the desire in the world, but I was overwhelmed with a feeling that building a web is complicated process. Not anymore! I love templatesnext team themes. You can check them out at templatesnext.org if you like. They have very aesthetic, modern & versatile themes, including basically everything you would want from a theme. For example: If you want to sell your own product or simply conduct affiliate sales, works either way as you can easily set up shopping carts in these themes & go full ecommerce-style right off the bat. They’re intentionally designed for that. Great & detailed review for how to create a new website from A to Z,but i have question i found that there is many themes to choose from but i didn’t find any search bar so i can pick a theme that i read about it in somewhere else! any advice ? because it will make it easy for me to choose the theme i like not search for thousands of theme to apply. Thanks for sharing. Most themes usually have two membership points – default demo mode & upgraded premium mode. This is usually the drill, so theme-developers get a little token for their work, in case you really like their work. Although, if you’re into programming, you can play your own game – as you’re going to have access to theme templates anyways, you could strip down the whole thing & build it up in highly customized mode. For a casual user, who won’t mess around with developing, I recommended to choose a theme that already is great in its demo mode. Don’t pick a theme, that yells at you at every corner “go premium go premium”, those a greed moves & bad for business. Screw them. There are excellent demo-level themes available! There are very expensive & inexpensive themes. It’s a vast ocean. If you have funds to spare, eCommerce themes are really fancy! The one I’m using here is i-excel theme, which is already outstanding & impressive in its demo mode – You can add site logo & icon (which a lot demo themes won’t support), plus it has default sliders, additional layout coding option & short code button kit with beautiful extras. Next upgrade from that would be i-spirit. And of course, you can buy theme that you found somewhere else & bring it over to WA. The most direct way to change your theme in WA would be uploading the new one to your websites FTP. In Wealthy Affiliate you also have the whole support team ready to help you out. Go for it! 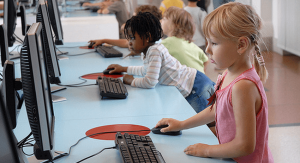 I love how you show the youngsters sitting at the computer! There are so many grown-ups that are fearful of trying anything new when it comes to technology. I like how easy it is to navigate your site. It is easy for me to find a topic and read about it. I am interested in learning more about what you have to offer. Hehe, I’m glad you like it! You’re absolutely right about grown-ups. It takes some time & encouraging for them to come around. For kids it’s piece of cake, another cool feature that can be adapted into everyday life. We also know, we’re massively overloaded with all the data available in the internet, so there comes the “is it worth my time” moment as well. It’s all natural. Life can be very easy. Let’s make it easy. Thanks for your visit & kind words, more updates on their way!